This handmade mini Amish rack can bring back memories of being at grandma's house with the smell of cookies and learning to to sew. It's the perfect gift for your children to play with or admire. 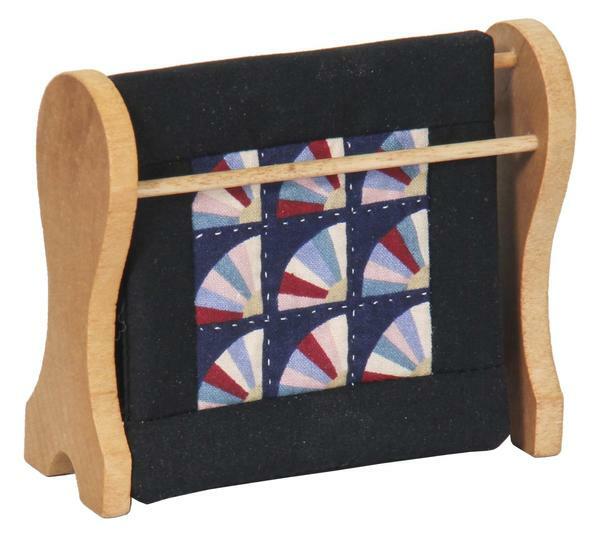 This 4 1/4" by 3 1/2" dimensions allows your children to have fun making smaller quilts while they are learning and display there miniature quilt pieces here. This toy can allow you to share your childhood joy of quilting with your family. This piece comes with a small adorable fan pattern quilt that has vibrant colors creating a cheerful feeling. Imagine the look on your child's face when they can finally show off all the hard work they put into their own first mini quilt. If you have any questions or need help, please call one of our friendly sales associates at 866-272-6773 or visit our Amish store located in Sarasota Florida. 4 1/4" x 1 1/2" x 3 1/2"